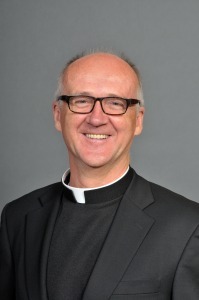 Pastor: Father Marek Ciesla, SChr. Appointed June 20, 2015 for a six-year appointment. Saint Mary’s Catholic Church is located in the town of Brush, Colorado located 90 miles NE of Denver. 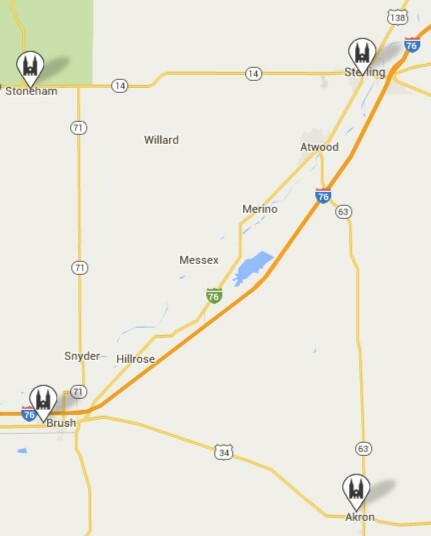 Saint John’s Parish, in Stoneham, Colorado, is a Mission of Saint Mary’s located 30 miles north of Brush. St. Joseph's Parish is located 25 miles east of Brush along US Hwy 34 in the town of Akron, Colorado. Saint Mary's parish is named in honor of the Holy Virgin, Mother of our Lord. Our feast day is December 8th. Saint John's parish is named after John the Apostle, one of the Twelve Apostles of Jesus. Our feast day is December 27th. Saint Joseph's parish is named after the patron saint and protector of the Catholic Church, and husband of the Blessed Virgin Mary. Our feast day is March 19th. We welcome all to participate in our worship and events, regardless of membership status, and to get to know us better. Whether or not you are a member, we welcome you to our parish community. When you are ready to become a member, there are several ways to join. If you are transferring to one of our parishes from another Catholic Church, simply complete the membership form and return it to the parish office. For more information, contact our pastor. If you are transferring from a denomination other than the Catholic Church, or if you have not been a member of any church, we encourage you to enroll in our newcomers R.C.I.A. program. We urge all of you who have found a home here, members or not, to support the work of the Church financially, and with time and talent. We welcome you to our Catholic faith community of the Archdiocese of Denver with three parishes located in Northeastern Colorado. Together our parishes form a vibrant, Christ-centered community of believers according to the Roman Catholic tradition. We invite you to worship with us at one of our parishes, St. Joseph in Akron, St. Mary in Brush, or St. John in Stoneham. Whether seeking God for the first time, looking for a new place of worship, or reconnecting with your faith, we welcome you.